A retail (household and corporate) run on a country’s banks is often the final step or a precursor to the final step for a country’s default. The chart below shows bank deposits fleeing Greece banks at an accelerated pace in Oct 2011 after a record pace of withdrawals in Sept 2011. 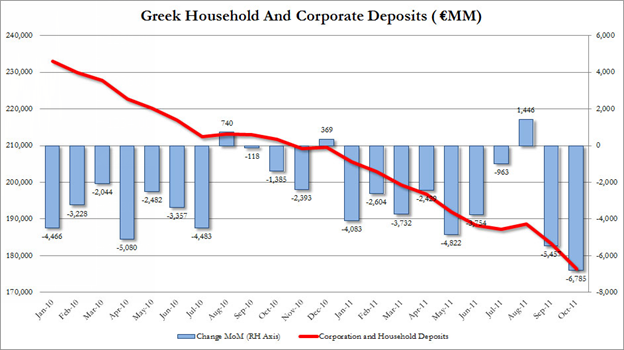 Deposits at Greece banks was €33 billion lower than the €210 billion deposit base at the beginning of 2010. With Greece bonds trading at or below 20 c/$ and the much touted Greece PSI (Private Sector Involvement) for the private sector to write down Greek sovereign debt by 50% unraveling, a hard Greece default seems to be baked in. Contagion to other countries is all the Europe can hope to avoid, but in a world of deeply interconnected financial systems, and where ECB, IMF did not contemplate writing down even a penny of their holdings of Greek sovereign debt, contagion surely looks to spread. Will the ECB ultimately fire a big bazooka soon?